Have you ever found yourself in a situation that the object you’ve put into the scene can be selected too easily or is covering some other important scene objects? What can you do about it? Well, you can disable this object every time when you don’t want to see it. However, you can easily forget about enabling it when your work on the scene is finished. There’s a better way solution! 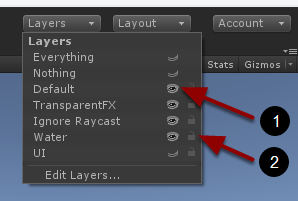 Have you noticed Layers button at the top-right corner of your Unity editor? Layers drop-down allows you to toggle layer visibility (1) and locked state (2). When the layer is locked you can’t select objects with this layer assigned by clicking on them. Object still can be selected using the Hierarchy window. When layer is invisible, all objects with this layer assigned will not be rendered in the Scene window. Invisible layers will still be visible in Game window and in the final product.